Pan was a lascivious Satyr of the mountains and the God of the Shepherds and the Flocks. His main task was to render the flocks fertile. Pan was the most famous of the Satyrs and a son of Greek god Hermes, the messenger of the gods and the Nymph Penelope(or Dryope). 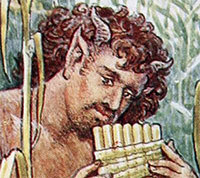 Pan was an ugly satyr with a long beard, sharp ears, goat legs and horns. Although Pan was considered a kind-hearted god, almost none thought highly of Pan, not even his mother, who ran away horrified and full of disgust when she saw Pan for the very first time. Many times Pan is depicted holding a pipe, delighting the gods with his divine melodies. His sacred tree was the pine tree. Home of the god Pan was Mount Mainalon in Southern Greece. There, the God of shepherds used to stay awake in order to spot Nymphs and seduce them. When the Nymphs confronted him, they fearfully ran to hide in the woods and the dark places of Mainalon. The modern word "panic" was named in Pan's honour, since a sudden appearance of his would easily cause overwhelming fear and terror.